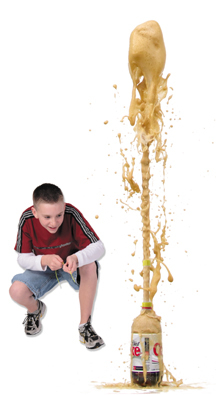 Best Testimonial – Ever… The Mentos-Diet Coke Geyser! For our #TuesdayTestimonial, I want to share what happens when you put a roll of Mentos quickly into a 2-liter bottle of Diet Coke, courtesy of chemical engineer and TA-65 user, Rocky Costello. I think it shows how curious, silly, and fun you can be when you rid yourself of chronic disease and realize you are getting younger, not older.